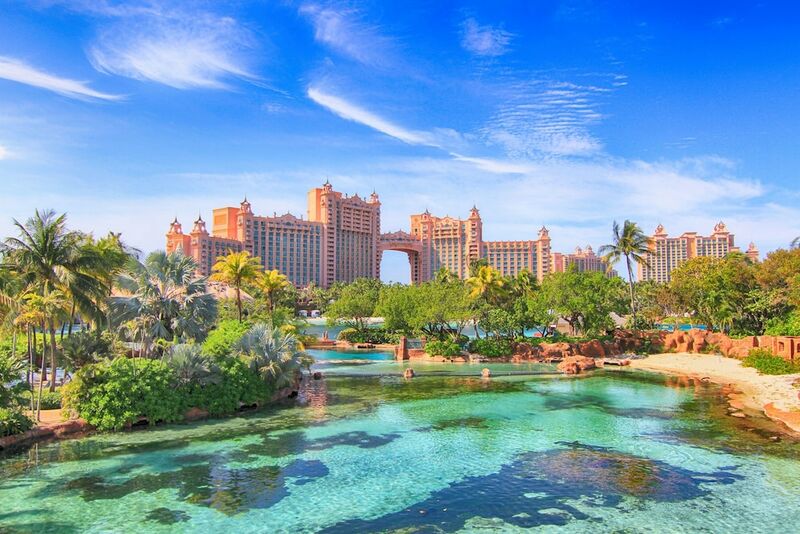 When you stay at The Royal at Atlantis in Paradise Island, you'll be next to a golf course, a 3-minute drive from Cabbage Beach and 8 minutes from Paradise Island Golf Club. This 4-star resort is 8.2 mi (13.2 km) from Cable Beach and 2 mi (3.2 km) from Ocean Club Golf Course. Make yourself at home in one of the air-conditioned rooms featuring refrigerators and flat-screen televisions. Rooms have private balconies. Cable programming and iPod docking stations are provided for your entertainment, while complimentary wireless Internet access keeps you connected. Private bathrooms with shower/tub combinations feature complimentary toiletries and hair dryers. Pamper yourself with a visit to the spa, which offers massages, body treatments, and facials. After dipping into one of the 11 outdoor swimming pools, you can spend some time at the private beach. Additional amenities at this resort include complimentary wireless Internet access, concierge services, and babysitting/childcare (surcharge). Grab a bite to eat at one of the resort's 20 restaurants, or stay in and take advantage of the 24-hour room service. Snacks are also available at the coffee shop/café. Relax with a refreshing drink from the bar/lounge or one of the 4 poolside bars. Buffet breakfasts are available for a fee. Fourteen exhibit lagoons are on site (lighted at night) covering 140 acres with 50,000 fish and sea creatures (200 species). Dolphin Cay contains nearly 7 million gallons of sea water within 3 lagoons surrounded by a white sand beach. Complimentary WiFi is available for guests throughout the property. The hotel offers a full-service spa, 21 restaurants, outdoor parking, currency exchange, sauna, health club, beauty services, and dry cleaning service. Guests can also access the nearby convention center. Please note: Children age 6 and older are welcome at Casa D'Angelo and Café Martinique. Dinner reservations are required for Café Martinique, Bahamian Club, Casa D'Angelo, and Chop Stix; reservations are required at Carmine's only if a party includes 6 or more persons. To avoid the $50.00 per person "no show" fee, reservations must be cancelled at least 24 hours prior to actual dining time. High chairs and booster seats are not available at Casa D'Angelo or Café Martinique. Plato's - Just off the Royal Towers lobby, this patisserie offers quick bites for breakfast, dinner or a late night snack. Sports events are shown in flat-screen TVs or unwind with live nightly entertainment. Poseidon's Table - This restaurant offers a breakfast buffet as well as international dinner specialties including sushi and freshly carved meats. Carmines - Located in Marina Village. Offers dining experience of famous New York landmark restaurant. Family-style dining. Classic Italian recipes include Chicken Scarpariello, Shrimp Scampi, Fried Calimari, and Veal Saltimbocca. Seafire Steakhouse - Located in Marina Village. Modern steakhouse atmosphere. Menu includes classic shrimp cocktails; Pressed Coriander Crusted Beef Carpaccio; Lemon-pepper Tuna, Sweet Bahamian Lobster Tail, and fine cuts of prime beef. Signature martinis; fine wines. Reservations required during peak dining hours. Water's Edge - In Coral Tower. Overlooking Water's Edge Lagoon. Buffet breakfast and dinner offered; antipasto bar, family-style Italian dishes. Casa d'Angelo - In Coral Tower. Fine-dining dinner restaurant. Northern Italian cuisine. Frescoed ceiling. Etched glass. Marble bar. Reservations required during peak dining hours. Chopstix - Intimate fine-dining dinner restaurant with dark-wood ceiling, banquettes. Chinese cuisine such as five-spice duck, lobster tail, Singapore noodles. Reservations required during peak dining hours. Bahamian Club - In Coral Tower. Steakhouse. Green walls, green ceilings, dark-wood trim. Sepia Bahamian family photos on walls. Steaks, prime rib, lamb, salmon. Dinner only. Reservations required. The Cave Bar and Grill - In Beach Tower. Open-air lunch spot featuring underwater views of marine life. Burgers, hot dogs, salads, ice cream. Nobu - In Atlantis Casino. Outpost of acclaimed Nobu Restaurant. Japanese cuisine served. Menu includes new-style sashimi and yellowtail with jalapeno. Reservations required during peak dining hours. Frankie Gone Bananas at Bimini Road - In Marina Village. Caribbean fare served. Outdoor bar. Grand open kitchen with conch station (Bahamian conch prepared to order). Menu selections include tamarind-glazed pork chop, grilled mahi mahi, and mojo-marinated chicken. Pineapple bread pudding, tropical sorbets, cookie-bash pie. Live entertainment; tropical libations. Reservations required during peak dining hours. Lagoon Bar & Grill - Open-air lunch spot located next to saltwater lagoon. Roof shaped like giant seashell. Sandwiches, salads, pizza, light meals, and tropical drinks. Shark Bites - Open-air lunch spot across lagoon from Lagoon Bar & Grill. Live Bahamian music. Lighter fare including sandwiches, salads, steak, seafood. Takeout counter. Murray's Delicatessen - Traditional New York/Miami deli featuring 1950s Art Deco decor. Breakfast, lunch, dinner. Takeout counter. Located on marina waterfront. Starbucks - In Marina village. Coffee drinks served. Olives - Renowned chef Todd English features his signature open kitchen and Mediterranean cuisine. The Village Burger Shack - Located in Marina Village, it offers guests a casual, family-friendly dining experience with indoor and alfresco dining. The menu features a selection of gourmet burgers, fresh fish, vegetarian dishes, salads, an extensive list of sides, and unique shake combinations and beverage selections. Aura Nightclub - This 9,000-square-foot Jeffrey Beers-designed nightclub is operated by PURE Management Group. The club is raised off the casino floor and accessed by a staircase. Aura features DJs spinning, a glass dance floor surrounded by banquette seating, two bars, two VIP sections, and a private VIP parlour. Dress code: Upscale, casual attire. Guests must be 18 or older with valid ID. Reservations are required for massage services and spa treatments. Reservations can be made by contacting the resort prior to arrival, using the contact information on the booking confirmation. A resort fee is included in the total price displayed.